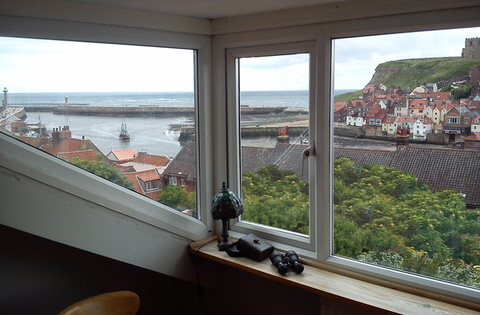 Whitby Holiday Cottage with fabulous views! This is part of the view from the top floor. Sorry - we can't promise there will always be a rainbow! 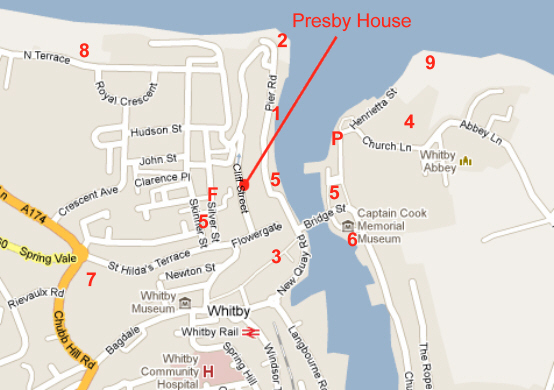 Whitby has lots of themed weekends including Goths, Ghosts, Pirates, Steampunks, 60's, 70's 80's, Northern Soul, Vintage Fairs, plus Folk Week and the Regatta. Sorry, but owing to the number of young people who use the house, we cannot accommodate smokers or pets. 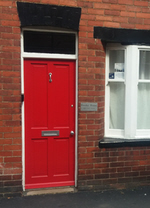 For all booking enquiries dates/rates please visit Holiday Cottages in Whitby. 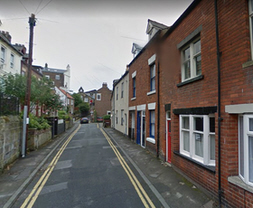 Cliff Street is a narrow little one-way road leading from Flowergate up towards The "Whalebones" and Captain Cook's statue. It's very convenient for everything. 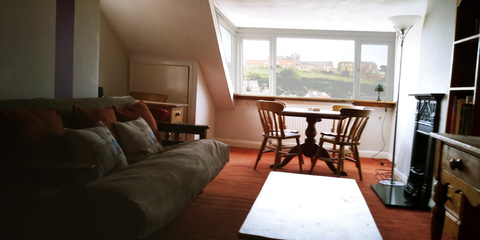 1 Harbourside - 2 mins walk down the passageways. Here you'll find the famous "Magpie" fish and chip restaurant. 3 Baxtergate which has banks and usual high street shops. Large Co-op Supermarket open longer hours is down by the railway station. 4 The Abbey via the 199 steps. 5 Specialist shops - including retro/antiques and Goth shops! 8 The cliff top includes the Spa Theatre, crazy golf, boating lake and paddling pool. 9 Slatebed beach - beneath the abbey cliff - superb for finding fossils at low tide! 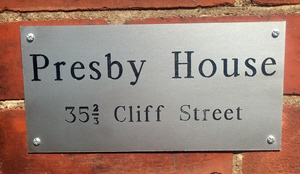 F Our favourite fish and chip shop is also the closest on Silver St! As well as the town attractions, there are lots of other beaches and harbours within a short drive or bus ride. 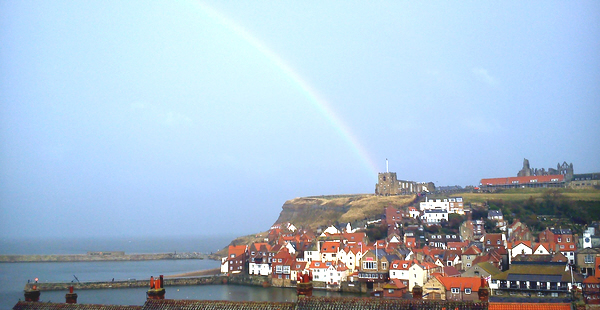 These include Robin Hood's Bay, Runswick Bay, Sandsend, and Staithes. The edge of the North York Moors National Park is visible from the top floor, regular steam trains run from the station and Flamingoland Theme Park is 26 miles away. Twin Bedroom. 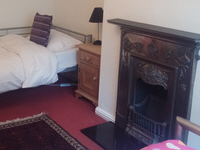 This has two single beds, TV, various cupboards and drawers. Dining room and kitchen. Table comfortably seats six (or more). 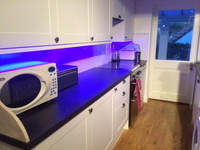 Kitchen with gas cooker, microwave, fridge, washer/dryer. Small conservatory for wellies, buckets and spades, folding chairs etc. Patio with table, chairs and abbey views. Red Bedroom. 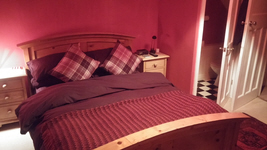 Double bed, ensuite wc, various cupboards, drawers, wardrobe, dressing table. Bunk Bedroom. 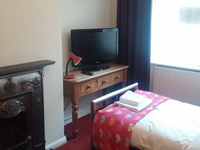 Bunk beds, TV, various cupboards and drawers and views of the abbey and old town. Bathroom with bath and electric shower unit, wc, basin and views of the abbey and old town. 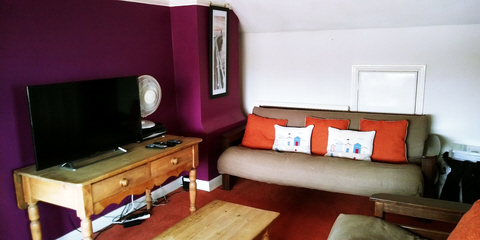 Main living room with two sofas, telly with SKY and DVD player, window table and chairs, writing table, books and games. 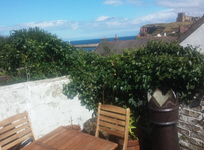 Panoramic views include the abbey, old town, swing bridge, harbour, Tate beach, the piers, lightouses, cliffs and the sea beyond. Night view showing the rooftops down Bakehouse Lane, one of the passageways to the harbour. 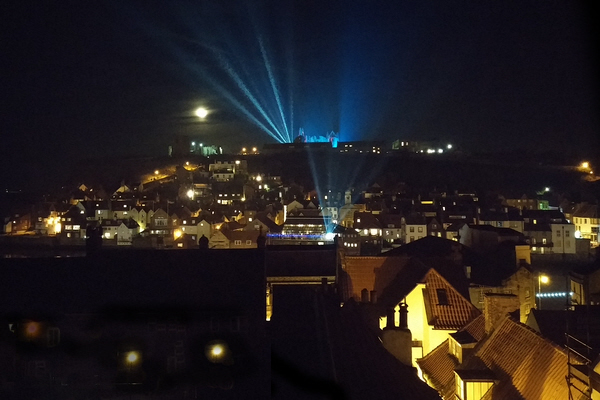 The Abbey and St Hilda's church are at the top, lit up for Goth Weekend - complete with a full moon! Like most houses in Whitby there's no parking in the street, but unlike some houses in Whitby, at least there is a street. PARKING/SCRATCHCARDS: Pull up to the side of the street and dump all your stuff in the house, then drive up to the DISC ZONE in the West Cliff Area. In winter months there is no restriction to parking here. In summer months you'll need a parking scratchcard, so one or two 4-day cards will be left out for you in the kitchen. The Whitby beach huts on the west cliff with the Whitby harbour piers in the distance.